Roy Moore Brandishes Gun At Final Campaign Rally - Joe.My.God. Republican Alabama Senate candidate Roy Moore drew a handgun from his pocket during a campaign rally on Monday as he made a final push to sway voters ahead of the state’s Republican runoff for U.S. Senate on Tuesday. Moore — who’s vying for the Republican Senate nomination against the incumbent, Sen. Luther Strange — pulled the gun out in an effort to convince voters that he believes in the Second Amendment, or the right to bear arms. “It’s been very hard for my wife and myself to wither two, nearly three months of negative ads that we couldn’t answer with money because we didn’t have it. Ads that were completely false. 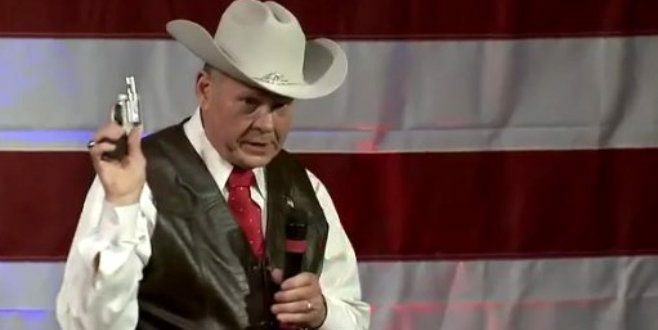 That I don’t believe in the Second Amendment,” Moore, a former chief justice, moments before he pulled out the handgun. “I believe in the Second Amendment,” he continued.